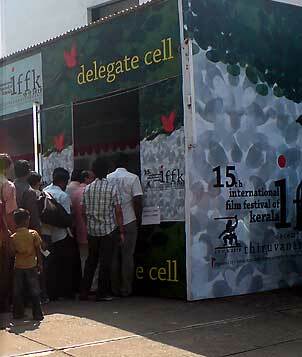 The International Film Festival of Kerala (IFFK) hardly raises any criticism in the media these days. And that is unlike Kerala. When the International Film Festival of India was held in Thiruvananthapuram in the eighties, almost everything sparked a controversy right from the opening film. Even a slight change in schedule or even a late arrival of a film can used to attract media attention and criticism. It was very much like the State awards which had hardly ever failed to raise a controversy. But for the few years, media hardly ever tuned into deficiencies of the festival. The roads in and around the festival venues were a mess, and there was hardly any parking space. Though it did get some mention in the media two weeks ago, then everybody forgot about that. Even on the opening day, workers were fixing the drainage system near the main venue of the festival. The world cinema section was an omnibus affair. ‘Why so many films’ was a question that was hardly posed in the media. There were several more sections to please all. However, the main fare was not of high quality. But we heard very little about that, not even about the documentary quality opening film which reminded one of Adoor Gopalakrishnan’s Oru Pennum Randanum. The festival seminars hardly rose to any standard with its permanent fixtures. Dozens of scheduled screenings were changed hours before the shows. Programmes got delayed. There were few personalities who could invite attention whether at the press conference or the open forum. Yet, the over-reacting media of Kerala kept the silence. Why? The reason is that the media is fully embedded in its organisation. They are there in different committee and programmes. The omnibus committees also cater to almost everybody who wants to be something at the festival including politicians. The patrons and co-patrons number about 125. The general committee has an estimated 300 members. The organisers have learned not to deny any passes, especially to the media. So, the festival turns out to be a big success story. Kamalahasan’s latest film Dasavatharam is not on par with the actor’s other creations. Despite the hype surrounding its release, the film did not bring out anything more brilliant than his performance in other films. He dons masks of various characters ranging from American President Bush to an old grandma. 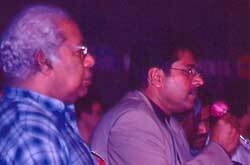 Simply because it is a masked performance, it falls far below his acting in Awai Shanmughi or Nayakan. Concept wise, the film is far behind Hasan’s Pushpak. Some of the sequences remind one MGR’s Ulakam Chuttum Valibhan and his techniques to achieve mass appeal. It also seems to be inspired by success films such as Annyan. Though fashioned as a sort of a thriller, suspense is sacrificed in favour of hilarious situations. The main selling point of the film is that it is a full-length comedy with run of the mill comic situations, mounted one over another. Many may like the tempo of opening sequences (which totally avoids comic situations) and concluding sequences. Some of the special effects such as that of the tsunami are of high quality. Keralite actress Asin is the heroine. Malliga Sherawath does a sizzling role.